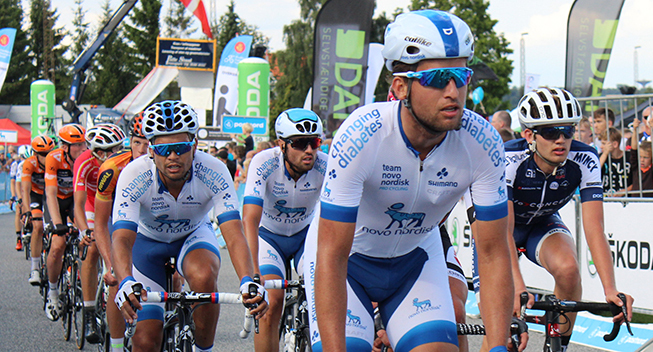 2017 will be a turning point for Team Novo Nordisk. Even though the US team has done a few WorldTour events in recent years, the results have been worse in 2016 and the five-year contract with the main sponsor is coming to an end. The team has undergone some changes and is targeting better results in an attempt to convince the sponsor to continue. Conscious that the work has been bearing fruit since 2012, Southerland knows that he is now necessary to reach a new level. The problem for the American team is that its roster is composed exclusively of diabetic riders which limits the talent pool. This does not prevent the team and its staff from having big objectives. The team hopes to be participating in five WorldTour events (Abu Dhabi, Tirreno-Adriatico, Milano-San Remo and Tour pf California) and to attend the Tour in 2021 to celebrate the centenary of the discovery of insulin. “The cycling media has heard our story a thousand times over the last four years, which is great as we’ve done an amazing job of getting the word out,” admitted Southerland. “But we need results and we are going to go in with very clear directives and operate more like a WorldTour team. To continue the adventure, Southerland and his riders will have to show themselves from the beginning of the season.